Pedro Martinez was diminutive in stature, but was one of the most imposing pitchers in baseball for nearly two decades. The hard-throwing right-hander amassed more than 3,000 strikeouts and 200 wins over the course of his career and earned a spot in the Baseball Hall of Fame in 2015. Pedro also endeared himself to collectors and was one of the most popular players in the baseball card industry during the late 1990s and early 2000s. This top ten list looks at the key Pedro Martinez cards that collectors should look to add to their collections. Shop for Professionally Graded Pedro Martinez Cards on eBay. 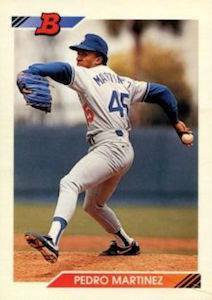 Martinez's first significant time in the majors came with the Dodgers during the 1993 season. He was used a relief pitcher, but was still better known for being the brother of Dodgers pitcher Ramon Martinez, one of the better pitchers on the team at the time. At the end of his rookie season, the Dodgers shipped him off to the Expos in a trade and Pedro's career took off north of the border. He helped the Expos to the best record in baseball in 1994 and later won the National League Cy Young award in 1997. Pedro Martinez's dominance continued in 1998 after he was again traded - this time to the Red Sox. During his first three seasons in Boston, he captured two American League Cy Young Awards, finishing second in the year he did not win. He also won a total of 59 games and stuck out more than 250 batters each year. Perhaps his most important feat as a Red Sox came in his final season with the team in 2004 when he teamed with Manny Ramirez, David Ortiz, and Curt Schilling to help the franchise win its first World Series title since 1918. His career ended with 219 wins, 3,154 strikeouts, three Cy Young Awards, and eight All-Star Game appearances. The first baseball card of Pedro Martinez appeared in the 1991 Upper Deck Final Edition set. 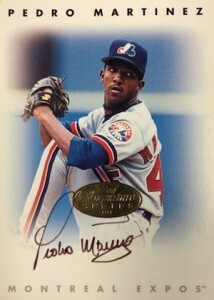 While it took collectors a little bit of time to notice his cards, by the end of his time with the Expos, Pedro Martinez had become a very popular player with collectors. Many rediscovered his early cards, which were predominately issued in junk wax products, while also seeking out hard to find chase cards during the 1990s and early 2000s. His successful run with the Red Sox greatly enhanced his place in the hobby and made him a popular target for collectors at the time. Pedro Martinez is still appearing in modern baseball card products, but his cards from his playing days remain extraordinarily popular with collectors. Key early base cards, short prints, memorabilia cards, and autographs are still very much in demand and have maintained very good value over time. 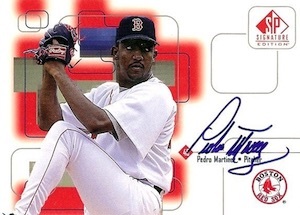 The following guide examines ten noteworthy Pedro Martinez cards. This list is a combination of rookie cards, memorabilia cards, popular base cards, and autographs that offer something for collectors of all budgets. 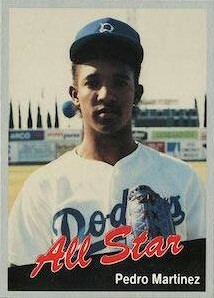 Pedro Martinez has several different minor league cards from his time in the Los Angeles Dodgers system, but this California League All-Star card is the best of the group. The set also features early cards for Mike Piazza and Raul Mondesi, making this a popular choice with Dodgers collectors. The California League All-Stars cards are not too difficult to find, but the Piazza and Martinez cards are definitely a factor in the cost of the set. These are not high-end cards by any means, but do cost more than the average minor league set. The 2001 Topps Heritage product is one of the best modern sets, with the short prints still being in high demand. Short printed cards include Mariano Rivera, Derek Jeter, Mike Piazza, Cal Ripken, and Pedro Martinez. Outside of his rookie cards, this card remains one of the most popular base set cards with collectors. The card has been especially popular with graded card enthusiasts. Collectors can also try to track down the foil version of this card which has a print run of 552 copies. 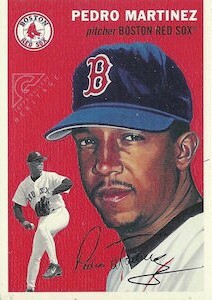 Pedro Martinez made his first appearances on memorabilia cards during the 2000 season. He did have a jersey card in the Fleer Ultra set, but this game-used baseball card has long been a favorite with collectors as it combines two popular Boston Red Sox players. At the time of the card's production, Martinez was the reigning Cy Young Award winner in the American League and en route to his second award, while Garciaparra was the defending batting champion, also on the way to his second title in a row. The combination of these two players has made this card one of the most popular, yet still very affordable, relics from the early 2000s. Pedro Martinez also has a version of this card with Yankees pitcher Roger Clemens, however, the card does not carry quite the same premium with collectors as the Garciaparra pairing. Collectors looking for a little bit nicer memorabilia card can turn their attention to his patch card in the 2001 Fleer Platinum Nameplates set. This memorabilia set ran several years in the early 2000s in the Platinum product and remains a popular source of patch cards. The cards feature smaller pieces of patch than collectors might find on some of the modern premium products, which opt for jumbo relics, but this card is much easier to find and more affordable. The print run of 120 cards has helped this card keep a visible presence with collectors, however, it also carries a higher price than many of the memorabilia cards from the early 2000s. Before there was a Topps Heritage set, the Heritage name appeared as an insert starting in the 1999 Topps Gallery product. At the time of the product's release, the art cards, which borrowed their design from a classic Topps set, were very popular with collectors. Topps produced this insert set in several other Gallery products in the early 2000s, but slowly phased the product out after the success and popularity of the Heritage set as a free-standing product. The Gallery Heritage cards have come down in price over the years, but these cards still remain some of the best-looking insert sets of the late 1990s and early 2000s and have continued to be a favorite among collectors. 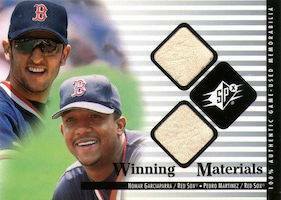 Pedro Martinez has a Gallery Heritage card in the 2000 set which borrows its design from the 1954 Topps set. This design was also used for the 2003 Topps Heritage set and the can be distinguished by the fact that the Gallery Heritage card features a drawn picture of Pedro and there is a Topps Gallery logo to the left of his hat. 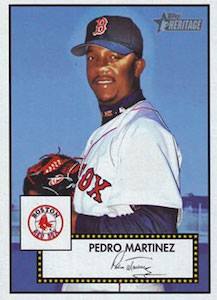 The Upper Deck Final Edition Pedro Martinez card was his first Major League Baseball card. This 100-card update set includes a combination of traded players, prospects, and MLB All-Stars. The Pedro Martinez rookie card is featured in the Diamond Skills subset, comprised of the first 21 cards in the set, which offers some of the best minor league players during the 1991 season. The set also has rookie cards for Jim Thome, Ivan Rodriguez, and Kenny Lofton. Although overproduced, and not overly valuable, this card remains a sentimental favorite with collectors. No Pedro Martinez collection is complete without a copy of this early 1990s gem. 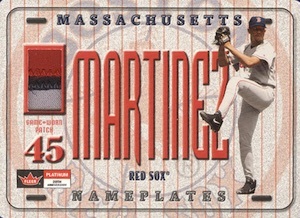 The 1996 Leaf Signature Series autograph was Martinez's first certified signature and also his most plentiful at 5,000 copies. Many of the star players in the Leaf Signature set were short printed, but Pedro signed the full allotment of cards. In spite of the high number of cards produced, this autograph is still very much in demand with collectors and can be one of the pricier non-SP cards in this set. Martinez's second certified autograph appeared in the 1997 Donruss Signature set. A little bit harder to find than the 1996 Leaf Signature, there are actually three different versions. In addition to a red version that features 900 copies, the most commonly found is the green Millennium Marks card limited to 1,000 cards. Slightly different than the current system, the serial numbering on the back of the card only features the actual copy number and not the overall print run. For collectors with a little more money to spend, or looking for challenge, there is also a blue Century Marks version that only includes 100 copies. Pedro Martinez's first Red Sox autograph appeared in Upper Deck's SP Signature Edition product. The autograph was never designated as a short print by Upper Deck, but the Martinez autographs were inserted into the packs as exchange cards with a May, 2000 expiration date. Even if the Martinez cards are not expressly limited, the copies of this autograph are hard to come across, and are often more expensive than some of his more recent autographs that feature very low print runs. This is easily Pedro Martinez's most desired autograph card. 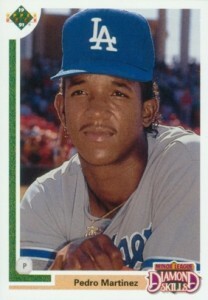 The 1992 Bowman card is not Pedro Martinez's first card, but it is his most popular early card. This set has become one of the best of the 1990s and features rookie cards of Mariano Rivera, Mike Piazza, and Manny Ramirez. The Pedro Martinez card is one of two popular second-year cards, along with Chipper Jones. Copies of this card are not as in-demand as the other rookie cards in the set, but this card is considered by many to be more desirable than his rookie in Upper Deck Final Edition. Both raw and graded copies of this card are very affordable and not too difficult to find. 2002 UD Ovation Swatches Pedro Martinez Game Used Jersey #O-PM PSA 8! Red Sox!